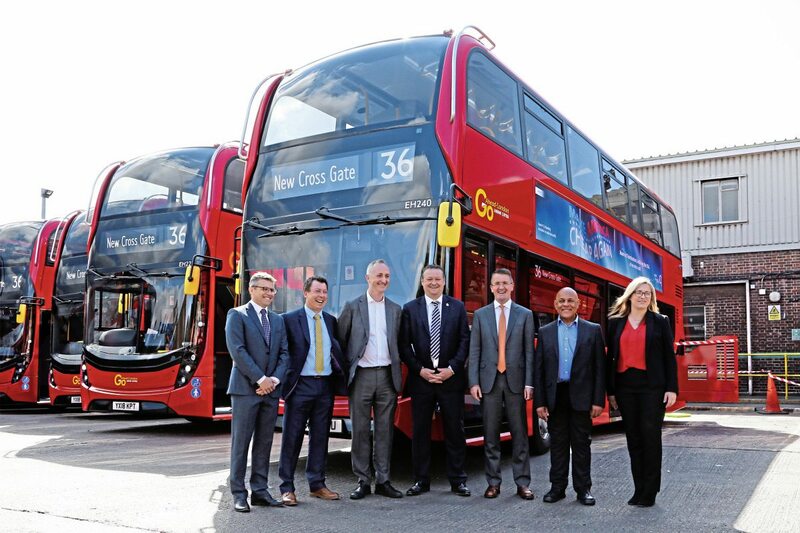 Go-Ahead London is the launch customer for the next generation of hybrid double-deck buses from ADL in partnership with BAE Systems. 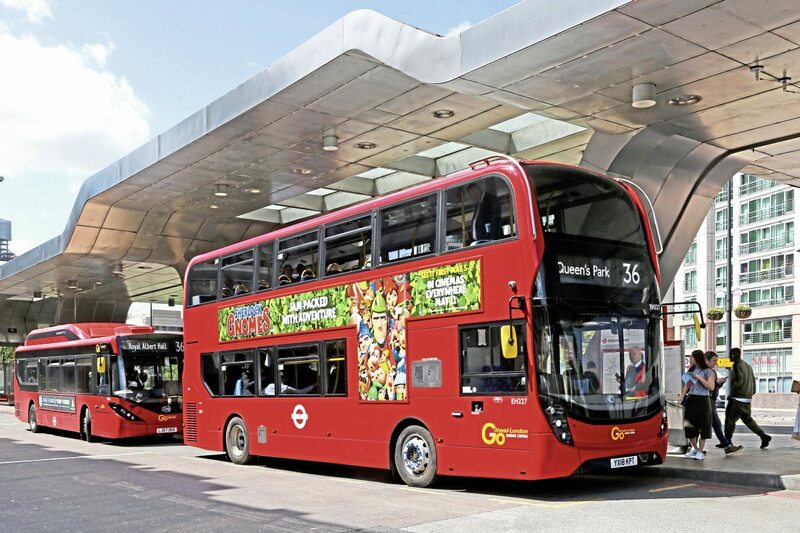 Almost ten years ago, the first double-deck hybrid vehicles developed by ADL in partnership with BAE Systems to TfL specification entered service in the capital. More than 1300 examples have subsequently joined them in providing a significant contribution to reducing CO2 output, the cause of global warming, through improved fuel economy. 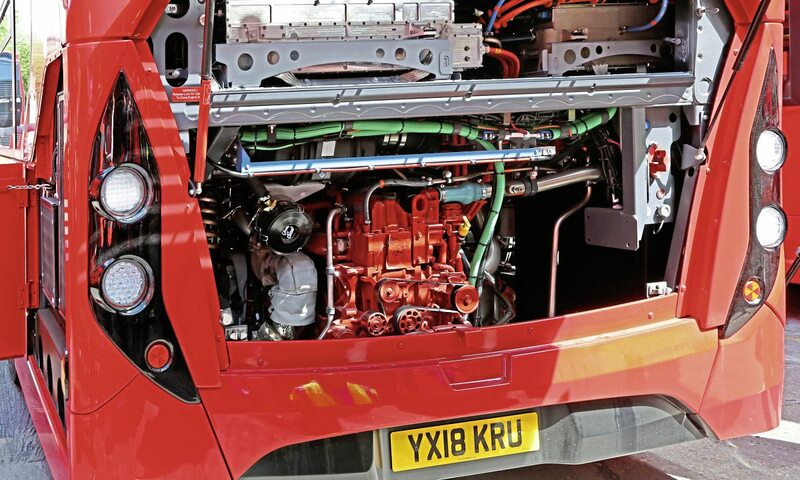 They have also played a role in cleaning up London’s air locally with the specification of contemporary Euro standard engines, moving through Euro IV to Euro VI. Most of them feature BAE Systems second generation, HDS100, system and all have ADL Enviro400 bodywork to classic, MMC and City designs. Now, the next generation from BAE Systems has arrived with the emphasis on reducing the TCO (total cost of ownership), primarily by adopting ultra-capacitors which eliminate the need for mid-life battery pack replacement as well as providing faster energy capture and release. Over a ten-year period, a 53% cost saving in replacement parts is anticipated from the new E-Series package. 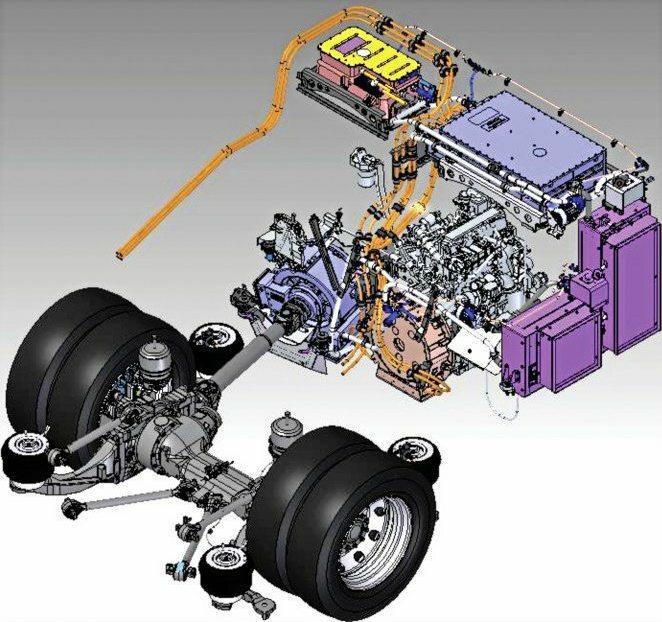 The new generation technology has no impact on the vehicle’s weight or space utilisation and offers the same performance characteristics to drivers as the predecessor model. 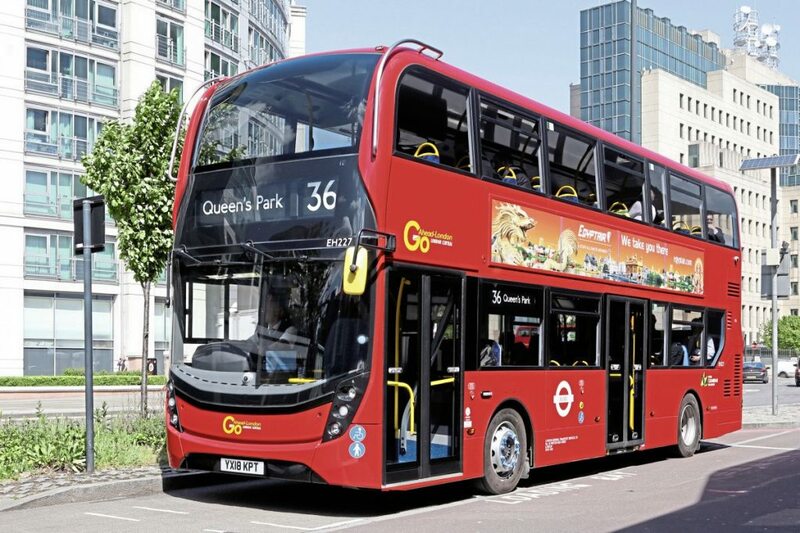 As launch customer, Go-Ahead London is receiving an initial 39 vehicles for route 36 which crosses London’s West End on its way from Queens Park to New Cross Gate. It has also committed to another 26 vehicles for routes 77 and 87. 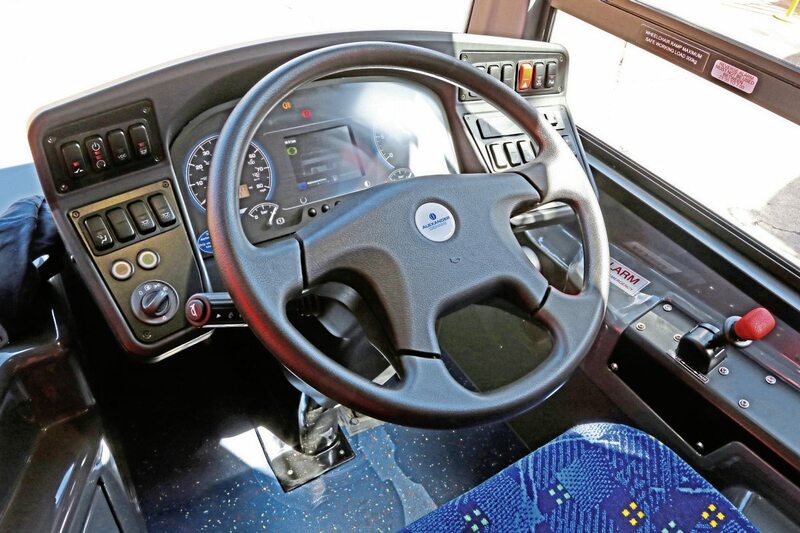 The company already operates 245 first and second generation Enviro400H and is focused on working with manufacturers to achieve optimal vehicles for its various routes. (LtoR) Matthew Lawrence (Business Development Manager, BAE Systems), Martin Brailey (Regional Sales Director London and the South, ADL), John Traynor (Managing Director, Go-Ahead London), Richard Harrington (Engineering Director, Go-Ahead London), Colin Robertson (Chief Executive, ADL), Colin Gerald (Bus Engineering Manager, Transport for London), Laura Cameron (Contract Manager, ADL). Driving Go-Ahead London’s commitment is Engineering Director, Richard Harrington who reminded the launch party that; ‘no one size fits all’ and ‘you don’t achieve anything without working together.’ The expected lower TCO was a key factor for Richard in maintaining the company’s competitive advantage in the London market. 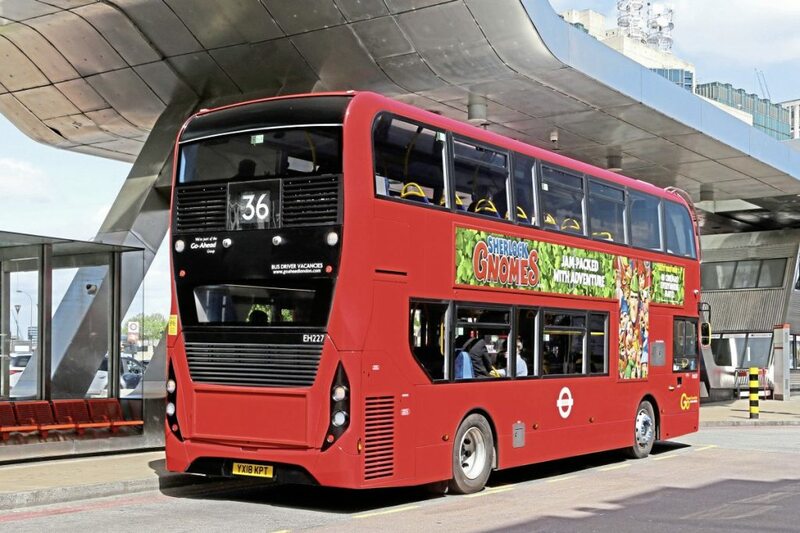 Mayor Khan’s Transport Strategy road map to improving London’s air quality already requires all newly procured double-deck vehicles in the central area to be hybrid. 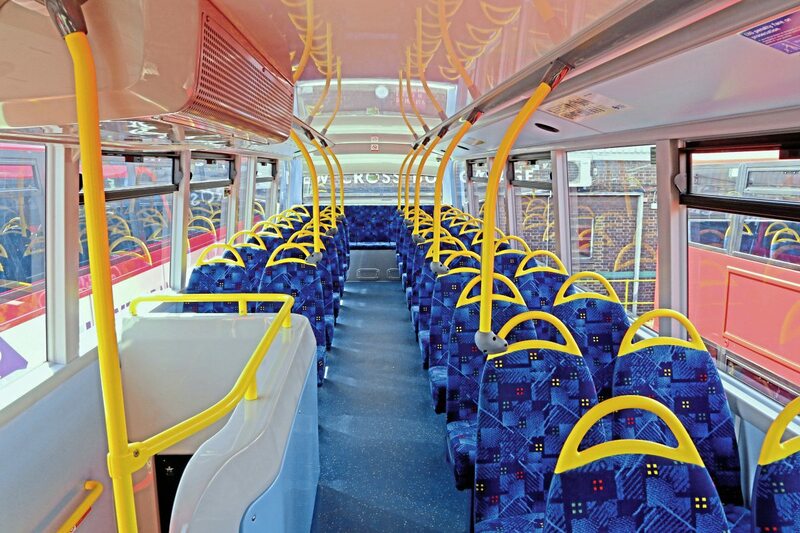 From 2025, only tailpipe emission-free, new double-decks will be acceptable for the central area in preparation for the 2037 target of all buses across London being free of exhaust emissions. In addition, by 2020 all existing buses need to be retrofitted to Euro VI standard and hybrids will be expected to play a bigger role outside of the central area. There is thus a significant window of opportunity for the improved hybrid technology that the new generation Enviro400H offers. 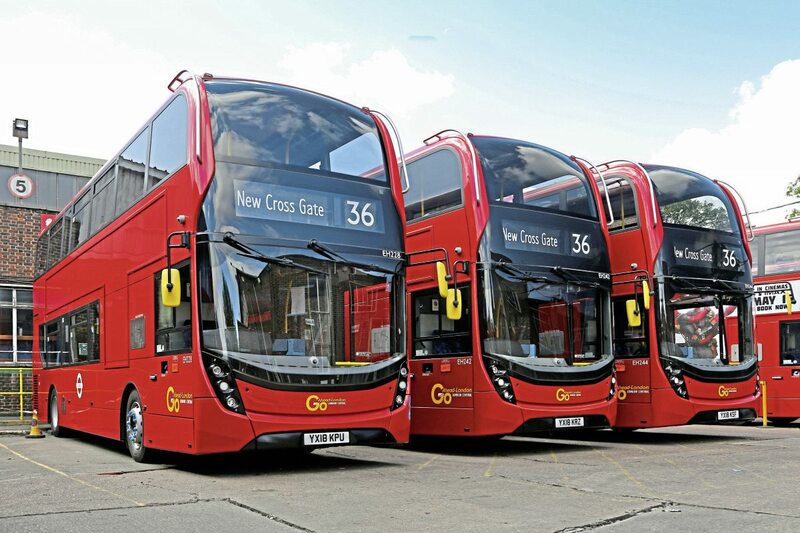 By the time of the launch at New Cross garage, many of the vehicles for the 36 had been delivered and were lined up across the yard receiving their final preparation for service, some already had external advertising applied. After the formalities, there was an opportunity to take one of the new vehicles along the 36 route to Victoria where there was a series of stakeholder presentations. The ride quality was up to the standard expected of the current ADL product and, in the congested streets of south east London, there was plenty of opportunity for the ‘arrive and go’ pure electric operation to be demonstrated. On the rare stretches of clearer road, acceleration was brisk with low noise levels. For this next generation of hybrid buses, BAE Systems has developed the Series-E package which, while retaining the proven series hybrid architecture, introduces significant revisions to improve performance and reduce operating costs. The headline change is the switch from batteries to an ultra-capacitor (ELDC – Electric Double Layer Capacitor) system for energy storage. With their ability to store and release energy at a much higher rate than batteries, the installed capacity can be significantly lower, less than 1kWh being sufficient to provide the same performance including ‘arrive and go’ as the 12kWh battery packs previously used. Ultra-capacitors have the advantage of a design life to match that of the vehicle, clarified at the launch presentation as being 12 years. The removal of the need for mid-life battery pack replacement has a major impact on the TCO over the life of the vehicle. The fully sealed ultra-capacitor pack sits alongside the control system above the vehicles engine and is air cooled, the need to change a filter on the air system being one of the very few revisions to maintenance regimes already in place for previous BAE Systems hybrid generations. The second major development is a new direct drive traction motor, DDTM 100, that, by eliminating the output gearbox and harnessing the power potential of modern permanent magnets, reduces weight by over 70kg (25%) compared with its predecessor and shortens the unit’s footprint. Reliability is enhanced by the reduction in the number of moving parts and the adoption of a mechanically driven oil pump. The mechanically decoupled power generation package including the current Cummins ISBe 4.5 Euro VI engine and after treatment system is carried over from the previous model. 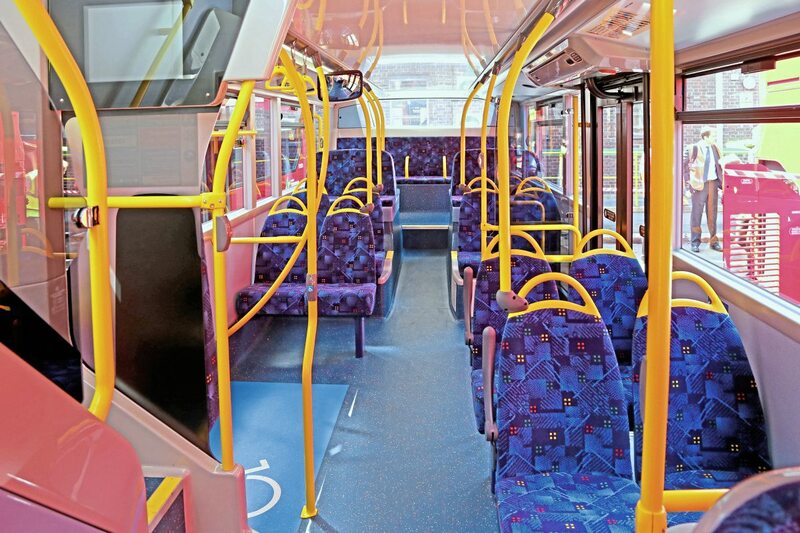 Overall, there is no change to the vehicles unladen weight of 12,060kg which allows a maximum 87 passenger capacity to meet TfL requirements within the 18,000kg GVW limit. An important milestone for the next generation Enviro400H was the award of ULEB (Ultra Low Emission Bus Scheme) certification in April by the LowCVP partnership following testing at Millbrook. The test cycle has been revised for 2018, the LUB (LowCVP UK Bus) cycle now combines MLTB (Millbrook London Transport Bus cycle which was based on London bus route 159) with a new section to reflect rural conditions. ULEB certification requires the vehicle to demonstrate a minimum 30% reduction in greenhouse gas (CO2e) emissions compared with an equivalent Euro VI diesel bus. 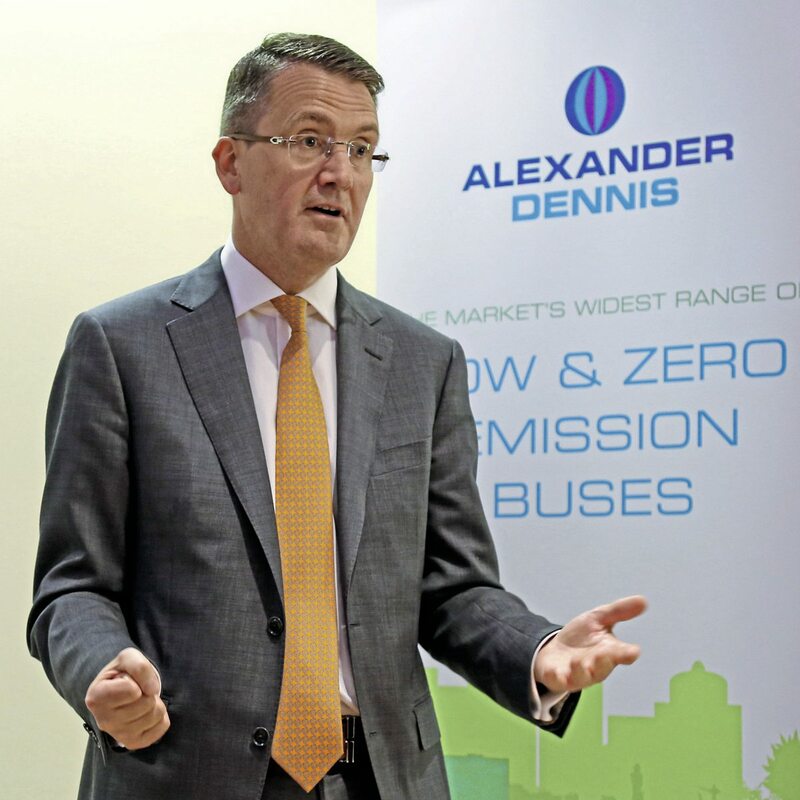 The next generation ADL Enviro400H achieved a best in class 37% in the test together with a 6% reduction in both CO2e and fuel consumption compared with its hybrid predecessor. It is the first UK bus to achieve ULEB certification. Certification qualifies the vehicle for purchase support from the DfT’s £48m Ultra Low Emission Bus Scheme, submissions for which need to be made by June 2018. ADL’s Head of Advanced Engineering, Stuart Cottrell saw the timely certification as “de-risking the bidding process” for operators. The vehicle also qualifies for the higher rate of BSOG in England (outside London) and Scotland. In presenting the latest BAE Systems Series-E hybrid drive, the company’s Business Development Manager, Matthew Lawrence, highlighted potential further developments of the system subject to sufficient demand. The modular architecture facilitated the prospect of the Series-ER where the ultra-capacitor pack is replaced by a 32kWh Li-ion NMC battery pack offering a 10km tail pipe emission free range without the need for opportunity charging. He also saw potential for retrofitting to existing hybrid vehicles when mid-life battery replacement was due. Where the full hybrid drive package is not appropriate, ADL already offer the smart pack of electrified accessories and the first double-deck vehicles equipped with their low voltage (48V) SmartHybrid package are now in service, initial tests showing they are delivering a 22% improvement in fuel consumption compared with a conventional Euro VI diesel bus. Colin Robertson confirmed the company’s commitment to achieve ULEB certification for further models, starting with the Enviro200EV electric single-deck.